QCOSTARICA – The pre-Columbian history of Costa Rica extends from the establishment of the first settlers until the arrival of Christopher Columbus to the Americas, that included the Atlantic regions of Nicaragua, Panama and Colombia, as well as parts of Venezuela and the Pacific coast of Ecuador. In Venezuela some 150 of Costa Rica’s pre-Columbian pieces seized in 2010 and 2014 by authorities, remain in that country waiting for repatriation. Archaeologist Marlin Calvo, head of the Department of Cultural Heritage Protection of the National Museum (Departamento de Protección del Patrimonio Cultural del Museo Nacional), will be traveling to Venezuela next week to determine the exact number of pieces, and confirm that they are in fact Costa Rican pre-Columbian objects, check their authenticity and assess the state of conservation. Subsequently, she will prepare a report for the International Letter Rogatory, a formal request from a court to a foreign court for some type of judicial assistance, the mechanism used to repatriate assets located abroad. How, when and why the pieces were removed from Costa Rica are unanswered questions. What is known is that they are part of the Mannil case. In September 2009, the National Museum filed a complaint against Harry Mannil Laul and his son Mikhel Mannil D’Empaire, for the “illegal trade in archaeological property”. Harry Mannil, who died on January 11, 2010, in San José, Costa Rica, was an Estonian businessman, art collector, and cultural benefactor in several countries, who as a result of World War II moved to Venezuela in 1946. Near the end of 2002, Mannil was forced to temporarily relocate to Costa Rica due to the Venezuelan general strike. Mannil’s sons succeeded him when he retired from active business dealings in 2003. On his death, his ashes were placed in a chapel on his ranch located in the mountains of Costa Rica. Mannil was on the Simon Wiesenthal Center‘s list of most wanted Nazi war criminals, accused by them of having participated in the murder of Jews while he worked for the political police in 1941–1942 during the German occupation of Estonia. After a four-year probe, Estonian investigators could find no evidence against him and he was cleared of the charges. Mannil started collecting pre-Columbian art in 1957, and eventually owned the largest private collection in Venezuela. His collection was regarded as among the 200 most important private collections by ARTnews magazine in 1997. Mannil classified his art collection into three main groups: pre-Columbian art, modern Latin American art, and art of the South American Indigenous people. 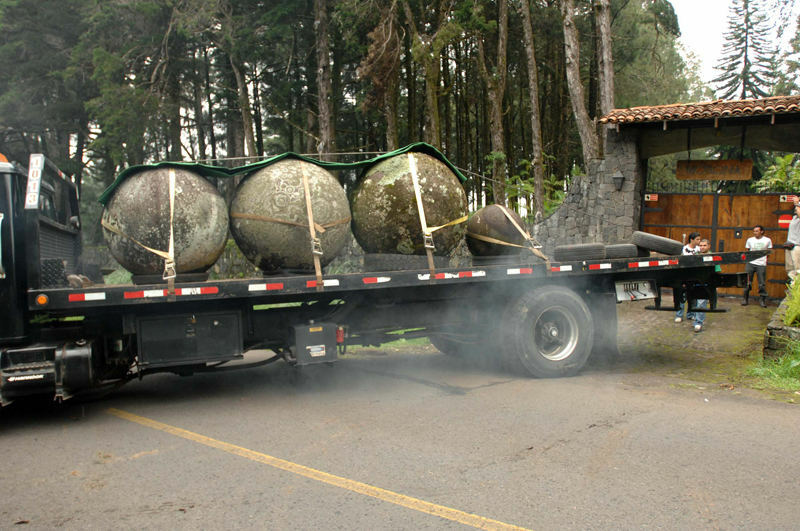 On July 22, 2010, after Harry Mannil’s death, Costa Rican authorities raided his Motilona finca (farm) in Heredia and seized 108 pieces of pre-Columbian art, including fourteen large stone spheres. Officials stated that the pieces had been obtained through an illegal purchase which had broken a law against trafficking in archaeological artifacts. Mannil left a footprint of Costa Rican pre-Columbian treasure in Venezuela. “The first is that 56 pieces were seized by the Customs Police and the Institute of Cultural Heritage of Venezuela, when the family tried to export to the United States,” explained Calvo. That was in 2010. In 2014, a second seizure was made, in the so-called Casa de los Jaguares (House of the Jaguars), a property owned by Mannil, located in Caracas. On that occasion 62 objects were recovered. “It’s called House of the Jaguars because there were stone heads in the form of jaguar, belonging to a metate, embedded in the wall as if they were ornaments,” said the archaeologist. These two lots were submitted to a survey by Calvo in last September. But there was a third group of pieces found in the mansion, which had not been removed because they were embedded in a wall of the house. This new batch, in custody of the Institute of Cultural Heritage of Venezuela, is what the expert will be examining. Both Calvo, and the director of the Museo Nacional (National Museum, Rocío Fernández), are satisfied with the results regarding the recovery of assets; however, recognize that it is a long process for repatriation, that includes court proceedings; the museum has no money for the return of the pieces. Still, Fernandez said they are getting quotes for moving the objects from Venezuela.